Tilda Swinton was on top form for the 68th Berlinale International Film Festival in Berlin, Germany this evening (February 15), where she took to the red carpet for the opening ceremony and ‘Isle of Dogs’ premiere alongside Greta Gerwig. There is no doubt this Chanel Pre-Fall 2018 androgynous look is very much in tune with Tilda’s style, but I feel like I have exhausted my excitement over this when Keira Knightley wore a similar look during Sundance Film Festival. 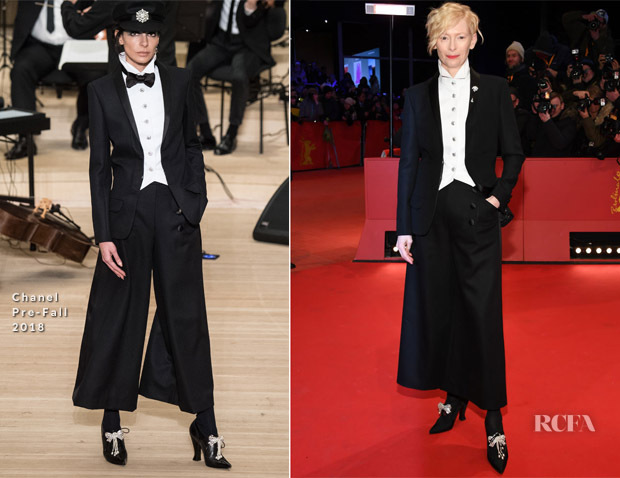 Some said Keira’s look (number 72) resembled a Charlie Chaplin costume, but would you tag the same label to Tilda’s look (number 73)?